Overweight backpacks can lead to potential back pain as children transport textbooks, laptops, sports clothes and papers back and forth between school and home. Poor posture, stress from sports and activities, prolonged inactivity while studying at school – along with these factors a heavy backpack can contribute to muscles soreness, shoulder and neck pain, numbness/tingling, headaches and back pain. Load the backpack strategically – place the heaviest item closest to the child’s back and distribute weight evenly over both shoulders. Chose a backpack that fits – adjust the straps (which should be well padded) so that the bag fits snug to the back. The bottom of the pack should rest comfortable in the curve of the low back. Along with the immediate discomforts of a too heavy backpack – symptoms of back pain in adolescence are associated with increased back pain as an adult. 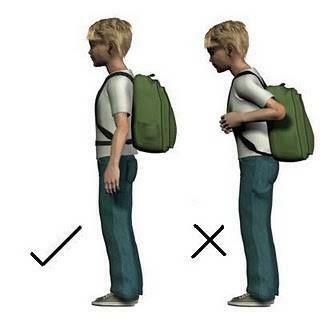 If your child is experiencing back pain, headaches or discomfort from using a backpack, speak to your Physio in regards to management and treatment. Stretches and exercises are valuable in treating and preventing further injury.